There are many safety issues for people with Alzheimer's/dementia such as driving and falls, but by far one of the biggest safety issues is leaving someone with dementia home alone. 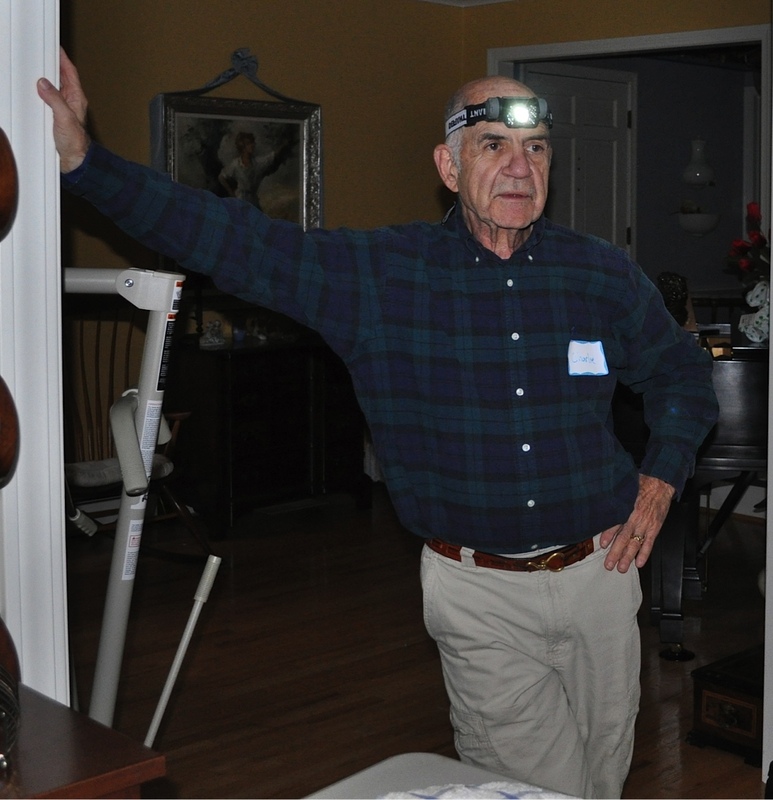 For some reason most caregivers can understand the need to take away the car keys, put up grab bars and bed rails to prevent falls, but we have a hard time accepting the fact that it is not safe to leave someone with dementia home alone. I think this is due to a few factors, one is that not enough people have the ability to stay home with their loved one or the money to hire caregivers, the other is that our loved one is an adult and we assume they should be able to stay home alone. Clearly, we need two things, first more resources for people to be able to hire caregivers or find ways to create a community volunteer system of companions for people with dementia. Second we need to accept the fact that even though our loved one is an adult, their mind is reverting back to a child. This does not mean we respect and love them any less, we are just understanding the change in their abilities and we will work to keep them safe. As soon as you notice your loved one forgetting what they were doing in the house, leaving the stove on, wandering out during the day or night, falling, or being confused in their own house, it is not safe to leave them home alone, even if they are sleeping. This would most likely start in later mid-stage dementia. As dementia progresses, people revert back to a more child-like mind and ability. You will even notice that they may not recognize themselves in the mirror because they only recognize their face from when they were in their 20's. Cognition and memory regress. We do not leave our kids home alone at 3, 5, 8 years old, even if they are asleep. It is not safe. We may not like to admit it, but the same is true for people with dementia who's minds are going back to being similar to that child of 3, 5, or 8. Leaving someone home alone is not safe because anything can happen. No matter how well we think we know their ability or how safe we think we set up the house, we all know accidents happen. 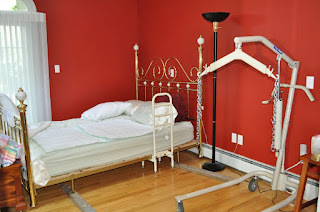 Even someone who is bedridden can get sick while you are gone, decide to try and get out of bed even though they can't and fall, or they could become afraid and panic thrashing and hurting themselves on bed rails. Dementia is unpredictable and while yesterday it may seem like your loved on is fairly safe and won't get too confused, today may be the day they leave the stove on with clothes on top of it, or get hungry and try to cut vegetables with a sharp knife and forget how to use it and cut themselves. Or what if you get in a car accident or get a flat tire and while you thought you were leaving them for an hour, you are now gone for 12 and no one knows your loved one is at home alone? I know all of this sounds scary and you might think "this won't happen to my loved one,"but it does. I was shocked the first time Mom left the stove on because she had not even cooked in months. Or when Mom would get suddenly scared not knowing where the dog is and walk out into the back yard to look for him. While I wish caregivers were not so expensive to hire, they are, and many people can not afford to hire 24 hour watch for their loved one. However, I have come to realize that if we just ask for the help we need, often we have friends or family members who will help out. I know quite a few people that go over a few hours a week to sit with someone with dementia so that their family member can go to the store. If you find a few people like that then you can have a rotation of people coming in for the week to help out. Or there are even neighbors who will check in on your loved one hourly which is better than just leaving them alone completely all day if you have to work. Don't be afraid to ask for the help you need, the worst someone can say is that they are unavailable. And if you know someone with dementia and you want to provide help, offer to come over and sit with them. Often families don't ask for such help because we assume it is too much to ask, too much of an imposition, and no one will want to do it. If you offer, you might just be giving that family a wonderful gift they were too afraid to ask for. Tonight at our church's Darkest Night Service (where we recognize not only the longest night of the year but also the fact that for many people have grief, sadness, and loss over the holidays), I lit a candle for Mom. I knew this Christmas would be hard for me since Mom is now in hospice and this may be her last Christmas with us, but I did not realize how much it affected me until I lit the candle and said out loud "This is for my Mom because this might be her last Christmas." I don't know if this is technically Mom's last Christmas and now that I think about it, I feel like last year might have really been the "last" one. 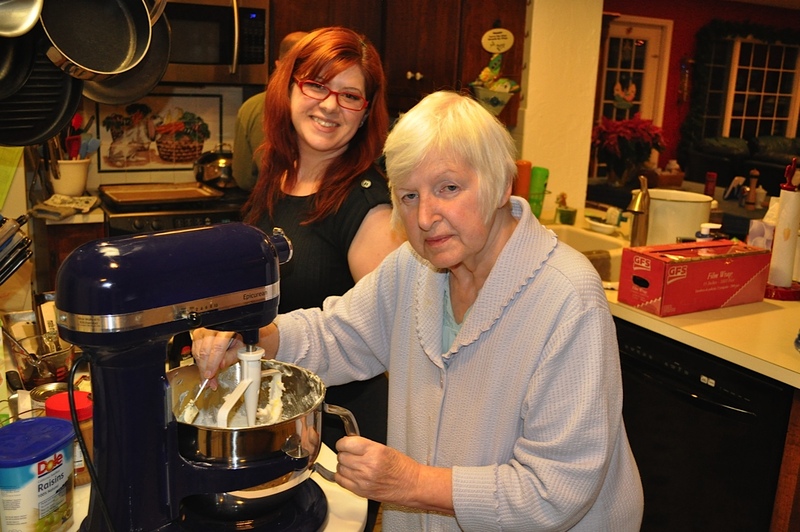 Last year was the last Christmas she was able to talk to her grandchildren, bake cookies, or open a gift. That was the last Christmas that she spent doing many of the things she always loved to do. Every Christmas we would make dozens of Christmas cookies, her most famous being sugar cut outs and gingerbread. 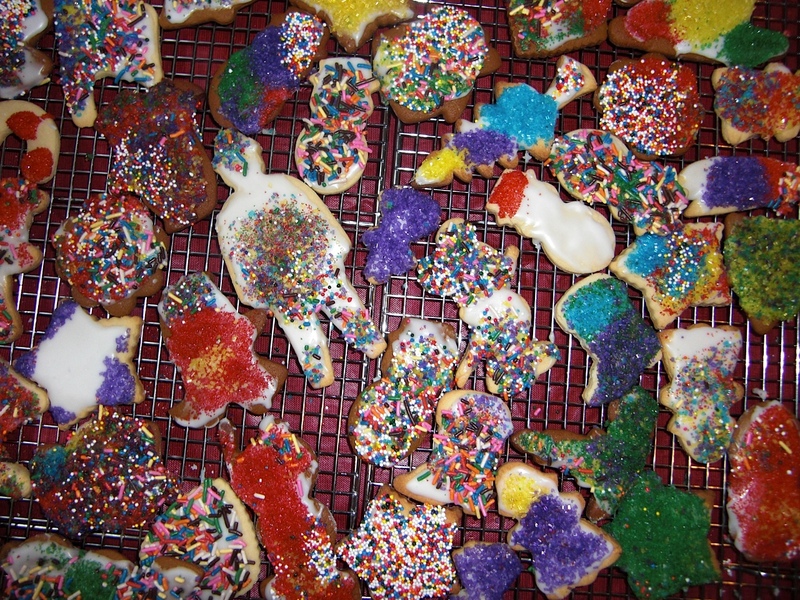 Then all of the kids and grand kids would gather together on the Saturday before Christmas to decorate the cookies. Last year she was able to help me make at least one of her Christmas cookies but tonight I made the dough for the gingerbread in my house by myself. No mother to make sure I was doing it right and to share the memory of making these cookies together that I have had for my whole life. 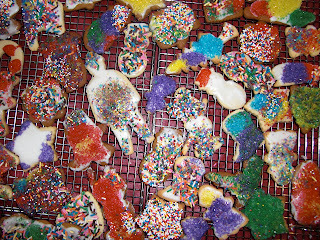 I am taking the cookies over to Mom and Dad's tomorrow with my husband and son to decorate with Mom like we have always done, but it won't be the same. She can not move her hands and arms to help decorate or even hold a cookie. I know the important thing is really the time we spend together, not exactly what we are doing, but it is still just sad. It is difficult to have lost your parent but also have them physically here. You know their spirit is still here and you can see it in their eyes at times but you can't have a conversation with them, create things together, or do really anything together that you used to do. We of course will make this the best Christmas we can for Mom and bring to her things that she loves about the season. Her grandchildren decorated her house and Christmas tree for her. We will make cookies together in the best way we can. We will eat together, let her see her grand kids open gifts, and laugh with her. But I have to admit that in all the joy I feel of her being here and being able to spend time with her, I am still sad. When my Dad and I talk about the activities we do with people with dementia every week with our foundation, the Carolyn L. Farrell Foundation for Brain Health, many people do not understand that playful activities are important to successful management of dementia. Our activities are simple, based on Montessori methods, but some people think that this is "too childish." However, it is reality that people with dementia slowly loose cognitive abilities and have a more childlike brain. This may sound sad upon first glance, but really it means they are more free to be imaginative and have fun with playful activities like wooden blocks, stacking materials, and abstract art activities. If someone likes an activity and it brings them joy, who are we to judge if it is "childish" or not worthwhile? One year old Jeffrey joyfully playing with his blocks. My husband and I play the same videogames as our son. I love to paint, draw, and create with paper. 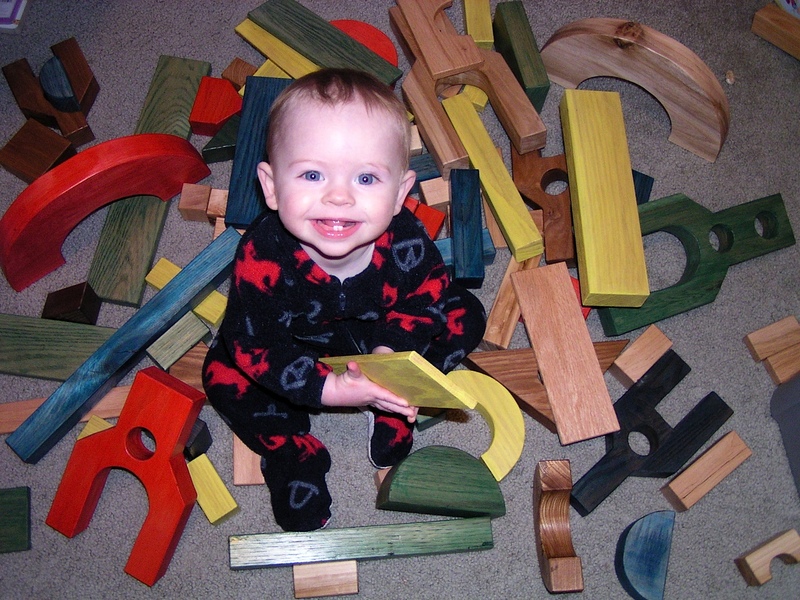 As a family, we build things with the wooden blocks my Dad helped us make for our son for his first birthday. I think all of these activities are worthwhile because they bring us joy and bring us together as a family. Here is a great blog post from the Alzheimer's Reading Room about the importance of play for people with dementia: How Important is Play for Alzheimer's Patients in the Late Stages? It is also a fantastic example of how caregivers can advocate for and insist on good care from nursing homes and in-home caregivers. I encourage us all to be more imaginative, have more fun, and embrace the joy of our childhood spirit. 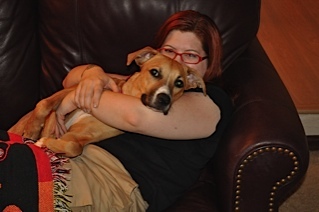 About four months ago we adopted a puppy who we are training to be my Psychiatirc Service Dog. While this training can take years, and our puppy Rosie is still just trying to learn how to contain her puppy energy, I find her to be an amazingly intuitive service dog. I have had many dogs over my lifetime but few have been so in tune with the emotional needs of the people around them as Rosie is, and she is just in the first few months of training. Today we had a family party and we were able to have Mom over to our house. Rosie was in her crate for the beginning of the party and after everyone arrived, I let her out. We had about twenty people in the house and instead of saying "hello" to the people that were in the room she was in, Rosie instead went directly to see my Mom. A person she has only met twice. Rosie was so attached to my Mom that my Aunt thought Rosie must have lived with my parents before we moved into our new house. She assumed Rosie knew Mom and missed her. Rosie was jumping up on my Mom, trying to get into the Broda chair with her. While this was not the best choice for Rosie because she was too hyper, her instincts were correct. Rosie somehow knows to "ground" people when they are injured or hurting. This is a deep pressure therapy where the weight of the dog helps to calm the person who is anxious. Rosie's instinct is to lay herself on top of people to help make them feel safe and comforted. "Grounding" will be a Psychiatiric Service Dog task that Rosie will be able to do, gently, on command but right now she does it in her hyper puppy way becasuse she just wants to help other people. I am continually amazed at the connection that animals have to us. I can't believe how Rosie knew, out of a houseful of twenty people who were in separate rooms, to go straight to the person who needed the most love and care. I felt so proud of Rosie today and her ability to help others. I also felt a great connection with Mom as she and I always cared for our dogs together throughout our lives. Rosie trying to take care of Mom was, for me, kind of another way that Mom and I are still connected despite the fog of dementia that keeps getting thicker and thicker. I am glad my puppy can see through the fog even better than most people can. I was browsing around on Facebook and saw this quote from French writer and poet Antoine de Saint-Exupery: "I know but one freedom, and that is the freedom of the mind." I think this quote is from his story The Little Prince, which is a well loved classic. This quote caught my eye and immediatly made me think of my Mom and other people with dementia. Actually it even made me think of those of us with mental illness. It is a reality for some of us that we do not have "freedom of the mind." We don't even know what really happens to the mind with dementia except that plaques build up in the brain and stop it from working- sometimes all of it, sometimes just part of it. One could argue that this is not freedom of the mind because you have lost the ability to use much of your mind. One could also argue that this is almost imprisonment of the mind becuase one of the things we are not sure of is if the person can think and inside, their brain functions just fine but it does not work well enough to send all the correct signals to get the infomation they want out of their brain. This sounds like a scary idea, but I have to admit that sometimes I see this with Mom. I can see her brow furrow as she is thinking of something she wants to say or she is trying to move her legs and her brain just won't let her do it. If I look into her eyes, I still see her in there and I do wonder if she is experiencing some sort of imprisonment in her brain. I hate that this could be happening to her, and I actually know how it feels. Some of the medications I have taken for bipolar disorder disrupt cognitive functioning and I would know exactly what I wanted to say and be unable to, or I would try and control my arm and it would not do what I asked of it. It is a terrible experience. While I think Antoine de Saint-Exupery's quote is prophetic in a way by saying that we always have that freedom, freedom of mind, and the idea is that no one can take that freedom away from you. I also think it is problematic because there are illnesses that can take that freedom away. And if this is the ultimate of all freedoms, what does that mean for those of us who do not have it? For me, I wonder if the one freedom I can think of is freedom of the spirit. I always see Mom's spirit even in the midst of dementia. Hurricane Sandy affected many of us in Cleveland and left quite a bit of Cuyahoga County without power. Mom and Dad have been without power for three days and the city estimates that most people will not regain power for another three. Being without power is difficult for everyone, but I did not realize what it would be like for someone who is ill and homebound. If my husband and I did not have electricity, we could go stay with friends, or go to the church to warm up, recharge our phones, and even use a microwave. But Mom can not move and we can't just take her to the church or even easily bring her over to stay at our house, where we do have power. 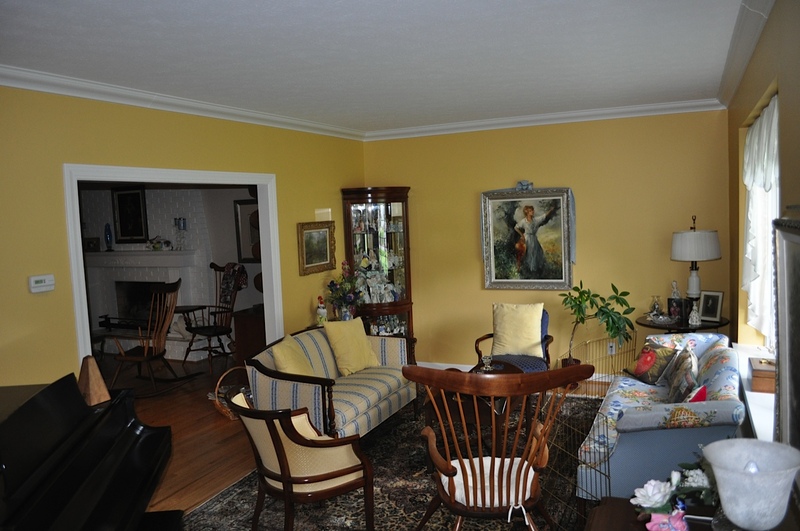 When we bought our house, we specifically looked for a house with a bedroom on the first floor so Mom and Dad could stay here if they ever needed to. However, to get Mom here now would mean getting the Broda chair, all of her adult diapers, wipes, bed pads, other supplies, and the Hoyer lift into the house. Not an easy thing to do and quite stressful on Mom. Hospice offered to take Mom to stay in a nursing home until the power came back on but that would be so traumatic for her that we decided not to do it. 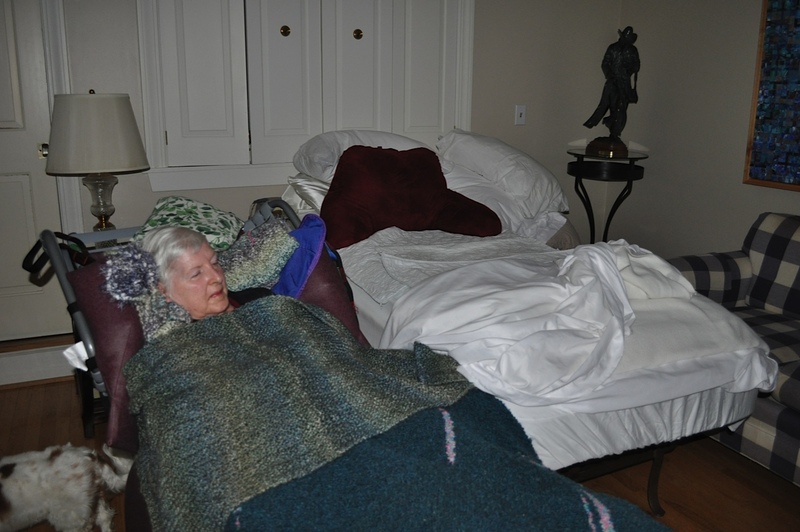 When I was working as a chaplain in home health care, we would take people for respite care for five days to nursing homes so the family can have a break. However, it was such an ordeal to get the person ready to go, then they rarely ever adjusted well to the move, and their care was not adequate often resulting in missed medication, illness, and bed sores. We just could not put Mom through that if we do not have to. Mom's makeshift bed near the fireplace. 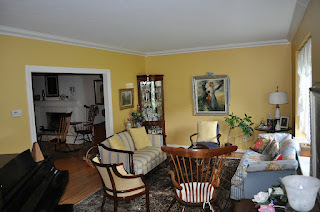 In order to make Mom as comfortable and safe as we can, we moved Mom, the lift, and even the mattress into the family room where there is a fireplace so she can stay warm. We actually had to put the mattress on top of the couch and coffee table (don't worry, it is the strongest coffee table ever) and we set up chairs around the bed at night for guard rails. Mom's wonderful caregiver Ana has been there every day and knows how to make great food out of what is available in the pantry. I am able to wash any laundry at my house and we can bring them food they might need. We are just lucky Mom is not hooked up to any electrical equipment. 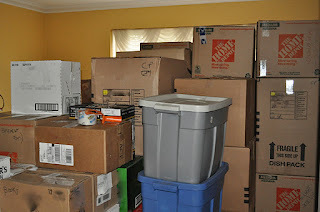 If this goes on for too many more days, we can move all of Mom and Dad's things to our house, but really any move would be very stressful to her. We also have the option for her to stay at Westlake Village since they have opened up rooms at reduced rates for people in need. We know she would get great care there. It has amazed me how so many people have been offering their homes, food, and resources to others in the community without power. Our church has been open for people to warm up and recharge and invited families in tonight to play games and watch movies. There are SO many people willing to help right now, but I never realized that when someone is homebound it is not so easy to help them in a situation like this. If your loved one is in a home hospice or home health situation, please know that you do have options if there are places that are open in your area. If your loved one is in hospice, your hospice provider should have called you and offered a care facility placement for them. Many local retirement communities and skilled nursing facilities will provide reduced rates for them to stay there until the power comes back on. You can also contact the Red Cross and local food pantries if you need food and Meals on Wheels can also bring you hot meals. Headlamps come in handy during a power outage. About nine years ago, my Mom's friend Sue started a knitting group. Mom and I have been part of the "Cultured Purls" ever since. I even went knitting the night before I was induced and the knitters were probably some of the first people my son ever met. 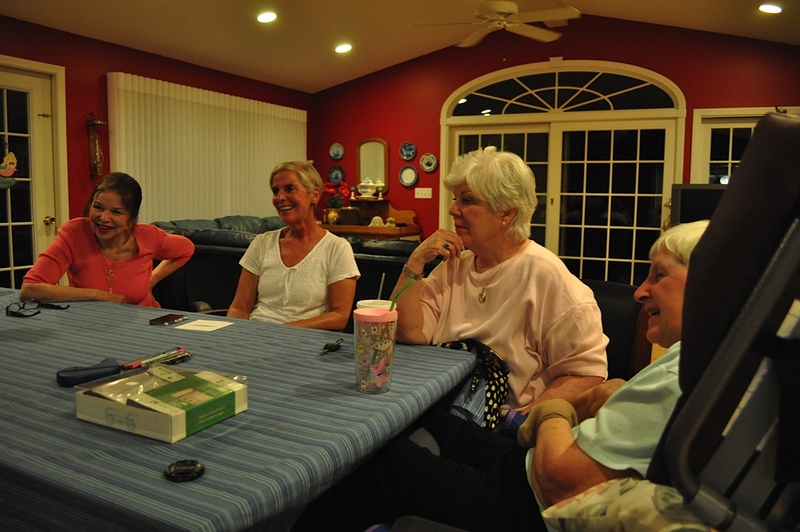 The group has met almost every Thursday night for the past nine years. 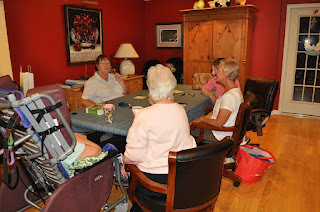 Three years ago when Mom's dementia made it so she could no longer knit, they still welcomed her in the group anyway. I think she took the same ball of yarn and needles with her every week for at least a year and her loving friend Sue (our knitting leader) always helped her knit a few stitches each night. 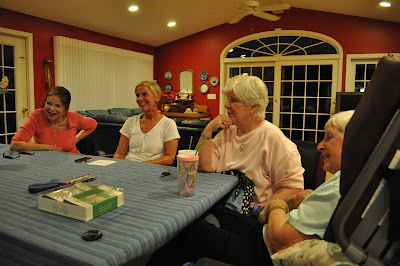 Unfortunately in the last year and a half, Sue got sick, Mom got worse, and the knitters met intermittently, but they always took care of each other. The knitters have been meeting at Mom and Dad's house now for a while and this Thursday night we got together for the first time after Sue passed away this Monday. When Dad told Mom that Sue died, many might think she would not understand, but she did and it made her sad. As we sat around the table talking on Thursday, Mom said to me "feels sad" and I know she knew that while we were reminiscing about Sue and telling fun stories, people were sad at the same time. Even in the midst of this loss, the girls made my Mom laugh and come alive in a way that she is not able to do most of the day. Just look at Mom's face in the photo below, she is smiling and happy as we laugh about some good times in our knitting group. Sue was always looking on the bright side of things and so her spirit was definitely there helping us all have fun together. This group of women, this group of friends, have been through so much and they take care of each other no matter what is going on. They are some of the few people who can make Mom smile and bring out her personality, which is never lost, just heavily covered in the fog of dementia. They talk to her instead of talk around her and they have never treated her different because of her dementia. Mom feels the emotions in the room and knows her friends love her. Fortunately these friends have allowed Mom to experience joy, happiness, and love on a regular basis. Never underestimate the power of friendship to beat dementia! Chris and the rest of the girls. Thank you to the Cultured Purls for being so amazing and may we continue to carry on Sue's legacy of knitting, love, optimism, friendship, fearless determination, and joy. I was helping to lead a training on activities for people with dementia the other day. Speech-language pathologist Kathryn Kilpatrick from Communication Connection was one of the presenters. She had a lot of great advice on how to communicate with someone with dementia which I will be writing about later. However, one of the comments she made really stuck with me as it addresses a problem I see all the time in families trying to care for a loved one. Kathryn said that each caregiver is on their own journey through this process. What she meant was that we will all handle the illness of our family member differently, and that's ok. Often what happens in families, and were I see the most difficulty created for them, is family members judging what kind or how much caregiving other people in the family are doing. For example, I was with a client once who was telling me about her "ungrateful" child who had not come to visit her in about a year. I noticed that while I think Miss. Mary is the sweetest little old lady ever, I really have no idea how she treated or still does interact with her child. While I could be fully present for Miss. Mary and help her through this issue, I also knew I could not judge her child. While we may not agree with what they are doing, unless they are putting their loved one in physical or emotional harm, or creating an unsafe environment, we should let people help as they are able. Even in families that are close, no one really knows the relationship each child had and has with their parent so you can't expect everyone to to provide care in the same way. Some people can't handle daily amounts of time with their loved one. Some are only comfortable with the person one-on-one because it may be detrimental to be with other family members. Some people just are not comfortable with doing things like bathing, taking someone to the bathroom, or changing adult diapers. 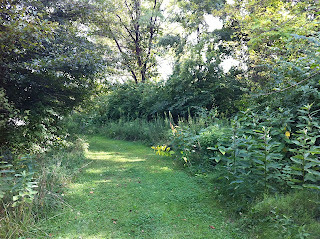 We also need to recognize on this path that people may have more or less energy for the journey at different times. Sometimes a caregiver you may need to pull back on what they are doing because it becomes too overwhealming, and that's ok. You can hire more help or rearrange the care schedule so that everyone gets a break at times. That is why in hospice, respite care is offered to the family every six weeks. In my work as a minister, I see far too many families fighting over the caregiving, each one expecting the other to do this or that, and missing the fact that everyone is on their own journey through this. The Plain Dealer, the local Cleveland, Ohio newspaper, just did an article about the Carolyn L. Farrell Foundation for Brain Health and the dementia program we run every Wednesday! The more trainings I take about caring for people with dementia and the more I really try to see the world from their eyes, I see how scary and unsettling life is for them. A very simple example of this is the Hoyer lift we now have for Mom. A Hoyer lift is a large device with a sling attached to it that lifts a person who can not walk and allows you to transfer them. We had a few new caregivers at the house to help train them on how to use the Hoyer lift because it is very easy to get bruised or dropped in the lift if it is not used correctly. 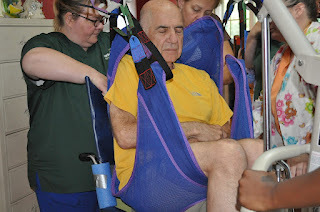 Dad and I let the caregivers practice transferring us in the lift. Let me tell you, it is pretty scary. You sit there while the people around you communicate with each other checking to make sure they have the right colored loop on the right hook so you do not fall out of the lift. They were just about to lift me once when I noticed one side of the lift was not attached and I was able to tell them before they lifted me. I was imagining what it was like to be Mom and maybe see that the lift was not correct, but not be able to speak to tell them. How scary! Then they lift you up and you are suspended and swinging in mid-air while the device rolls across the floor taking you to your new destination. 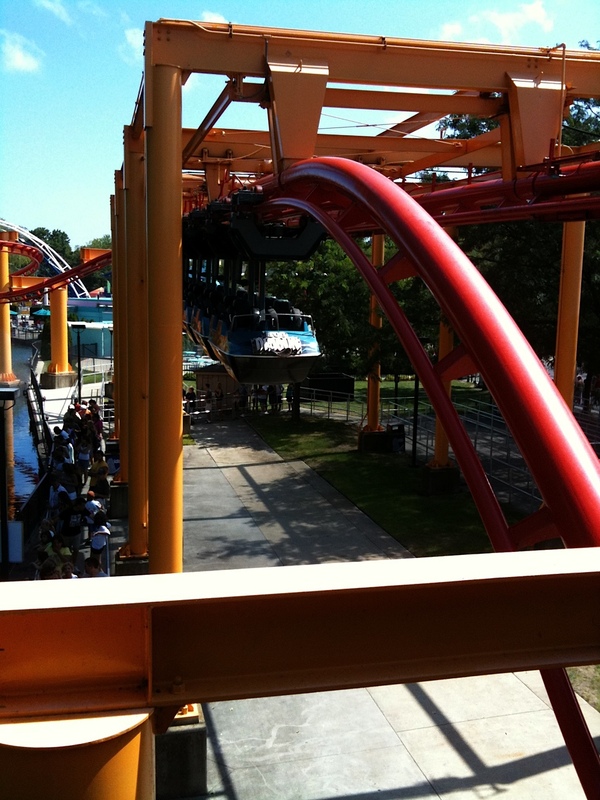 Someone has to watch your forehead so it does not collide with the metal bar at the top of the lift and another person holds your legs so they do not swing and hit the metal pole that is the center of the lift. You would think you might feel like you are wrapped in a cocoon but you really feel like you are swinging from a crane like a fish caught in a net that could drop at any time. I can see how this is terrifying for persons with dementia. No wonder many of them get agitated during transfers. 1. Always tell the person exactly what you are doing at every moment. "Carol, we are going to move you from your chair to the bed. 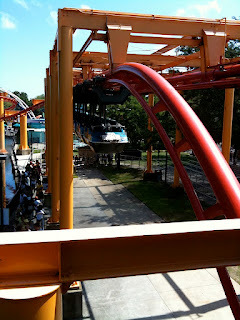 We are getting the lift ready. Now we are going to raise you up." 3. Each caregiver should check to make sure the other got all of the loops on the right hooks as a safety measure. Say out loud that everything has been checked so the person can hear you and feel a bit more safe. 2. Reassure safety: "Carol, we are going to raise you up. The lift is safe and we are here for you." No matter what, much of life is going to be scary for persons with dementia. Even if you think they cannot hear you or understand, they probably can, so the best thing to do is communicate a lot with them. Always tell them what is going on around them and what is happening next. And in every situation try to see it from their perspective in order to understand their needs better. I was looking through photos and noticed that I have a photo of Mom from almost exactly one year ago today. 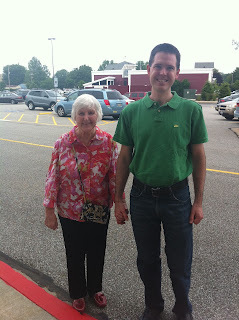 This photo of Mom and Jeff is from June 19, 2011. Sometimes I forget how much has changed in the last year. Mom was walking, able to talk with us, go out, and feed herself. Today she is on hospice, barely talks, needs to be fed, stays in bed or a Broda chair, and has to be moved with a Hoyer lift because she can't walk or move on her own. You can tell from this photo that so much has changed in the last year. Photos like this remind me to not get too caught up in just what is happening right now but to remember that our lives are made up of all the years we have been here. It can be easy to get bogged down in just how hard things are right now and forget all of the other great years you have had together. Hospice: What's In A Name? Last week Mom qualified for hospice. When most people think of hospice, they immediately assume that the person will be dying within the next few weeks and hospice is an emergency situation. But really hospice is a concept of care for terminally ill people in which care will be provided that will neither prolong life or hasten death. Hospice focuses on comfort care, maintaining dignity, and addresses the emotional, social, and spiritual aspects of dying. To qualify for hospice, a doctor must assess the patient and determine that they believe the person has no more than six months to live but really people can be on hospice for days or years so time frame is really not a given once someone is put on hospice. So, that is what the name hospice technically means, but we have found the name has meant so much more in how people have started treating Mom. It has been surprising to me and Dad that as soon as people heard the word "hospice," they have been calling and asking how they can help. Do we need food? Would Mom like visits from people? The thing is that for at least two years we have been telling people directly: "Carol would really like you to visit with her." 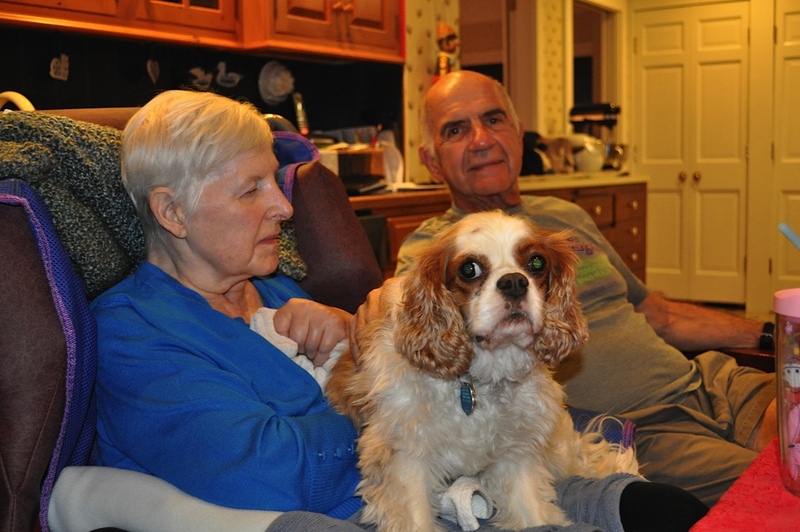 Yet just a handful of family and friends have visited her and in fact more people have withdrawn from her than visited her since she was diagnosed with dementia seven years ago. There are a few things going on here that I can tell. One is, like with most diseases of the brain, people are scared of dementia. Dementia has a lot of stigma attached to it and people don't know how to communicate with their loved ones with memory loss. Due to fear and being uncomfortable, people often abandon those with dementia. What people don't know is that you can often help people most just by your presence, by spending time with them. In any illness, no amount of food made, sheets changed, or dishes cleaned matter in the end. The deep feeling of abandonment when people pull away and don't visit breaks someone's spirit in a way that is indescribable and at the end of their days, that feeling of long-term abandonment is what they will remember, even people with dementia. In my experience with Mom and in my work ministering to many people at the end of their life, I have seen the most pain happen not because of illness or the question of "Why is this happening to me?" but rather the question "Why did everyone leave me?" This is the spiritual question at the center of their suffering. I try to explain that people don't pull away because they don't care. Rather our American culture has taught us to be afraid of anyone who acts "different." We also hide the sick and dying and we think we can fix everything. We teach that the only way we are of use is to solve problems but not deal with emotions. So most people pull away because they just don't know how to be present with us in our hardest times. Along the same lines, this abandonment happens not only to the person with dementia but to their caregivers as well. Bob DeMarco has written a wonderful piece about this in the Alzheimer's Reading Room called Are Alzheimer's Caregivers The Forgotten? He is much more blunt than I am and I would just like to quote one part of his post: "Like it or not, if you are a family member or friend of an Alzheimer's caregiver and you are not helping them -- you have abandoned them. I am sure this sounds harsh. But, it's not even close to the harshness of your own behavior." I do hope that this blog post helps you if you have a loved on who is sick to know that your presence is needed before they end up in hospice. I know it's scary and uncomfortable, but if you can visit for a bit you will bring more help to your loved one than any medication, cleaning, or doctor can. You are walking with them through the hardest and loneliest time of their life. You are the footprints of God which will accompany your loved one on their journey. We now have hired caregivers in the house 24 hours a day, plus Mom is in hospice so we have nurses aids coming twice a week and a nurse once a week. They are all fantastic people and Kendal at Home is working hard to coordinate our caregivers from Caringtree and the aids and nurses from Hospice of the Western Reserve. The problem is that providing care in the home is difficult. Actually, providing good care at home or in an institution is difficult too, but for different reasons. So, let's talk about some of the issues in home health care and how to manage them. The first thing is that hiring a caregiver from any of the home health agencies does not mean you are getting a medical professional. These caregivers are great but some may only know how to do tasks like grocery shop, cook, and clean. Others may only be companions. When your loved one gets sicker, like Mom, you really need to explain exactly what you need in order to get the right person. The problem is, most of us do not know what we need as we are not doctors or nurses ourselves. Fortunately my Dad is a doctor and so he notices when someone is feeding Mom too fast and she could aspirate or choke. Dad and I have both been in hospitals enough to know Mom needs to be turned every two hours to prevent breakdown of her skin (bed sores). She also needs fluids every few hours and must have her incontinence briefs changed. She has to be lifted out of the bed with people trained on how to use a Hoyer lift. She really needs constant supervision and medical aid for her tasks of daily living (toileting, cleaning, and eating) and these need to be done in a way that are safe for her which means you need medical training. When a family calls a home health agency for help, we assume since this is their profession they can assess the situation and know exactly what needs to be done and the skill level needed for the caregivers. This is not true. And, that is not saying anything against the agency. I think what is happening is that home health care is new, there are few regulations, and they are figuring out how to get everyone trained for every possible situation within the federal regulations of what kind of care non-medical professionals can provide. Hoyer lift in Mom's room. We now have a hospital bed for her. So, here are some of the things I suggest you ask in order to get the right caregivers in your home. Help the home health agency figure out if you need a caregiver, nurses aid, or nurse because they are all different. 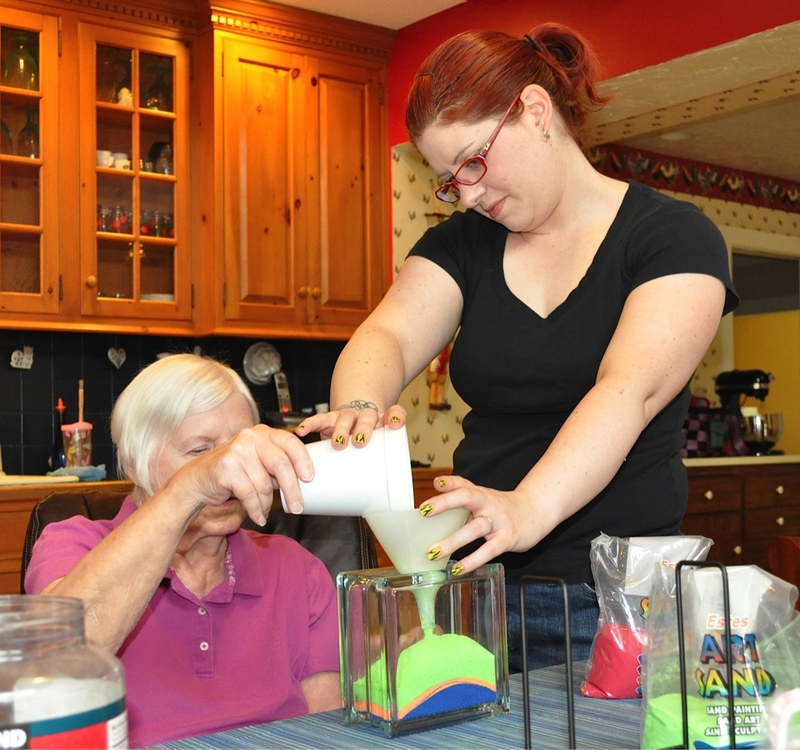 A caregiver can feed someone who can not feed themselves, but they may not be trained to feed people who have difficulty swallowing and could aspirate like a nurse would be trained to do. If your loved one can't feed or drink for themselves ask if the caregiver has been trained for proper feeding of people with swallowing difficulties. Does the caregiver know how to avoid aspiration of foods and liquids and what do they do if it happens or the person chokes? If you have equipment in the home, will there be at least one caregiver on duty who knows how to use the equipment at all times. Have them show you how they use it, and practice on you, not your loved one. Mom got dropped out of the Hoyer a few times. Always watch all new caregivers perform all tasks before you leave them alone with your loved one. Each situation is different and your parent, friend, or child deserves personal care so make sure the care is tailored to their needs. Always kindly ask for what you need and never feel like you ask too many questions. These agencies really want to care for your loved one well and with dignity but this really is a new area for all of us so they are open to feedback and working together with you. Thank your caregivers when they do something well. Let the coordinator of the home health care agency know when the caregivers have gone above and beyond. Don't panic! One or even a few mismatched caregivers does not mean you will never find the right ones. It takes an adjustment period but it will work out. Our experience has shown me that communication is key. We trust that the organizations we are working with are good people who really care about Mom, and that is important. If you feel they don't, then find a different group. Fortunately for us, the people we are working with are great and trying to get Mom the best care possible. As we have found good matches for caregivers, some of them have brought music for Mom to listen to, talk with her, Mom has NO bed sores (this is amazing), they advocate on her behalf if they think a new caregiver might not be a good fit or if we all need more training on some new medical equipment. While it may be stressful at times, our little army of people keeps talking in order to find out what is best. And every time families and home health agencies work together, the more we learn and can create a better system for everyone going forward. We have been trying to create more Montessori based activities for Mom and we have noticed in a home care environment that it is hard to think of something new all the time. In fact, it is hard to even create one new activity a week. Also, we need some activities that anyone can do with Mom even if they are not familiar with the Montessori format. Follows Montessori principles of being fairly self explanatory, has a template to follow, and accessible to the skills Mom still has. Ongoing project that you could do multiple times a week but it not actually the same thing over and over again. Provides some variety. Anyone can pick this up and do the activity with Mom. Easy to understand and follow for all. Needs to be meaningful so Mom does not feel like she is just doing busywork. I am an avid scrapbooker and have been wanting to scrapbook with Mom her hundreds of photos but scrapbooking takes a lot of color coordination, cutting, pasting, writing, decorating, etc... and is really too complicated for Mom. 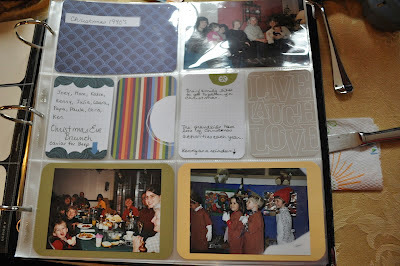 However, I found a new scrapbooking style that is still pretty but much more simplified. It's called Project Life by Becky Higgins. Project Life is a simple scrapbooking system with coordinating journaling cards and patterned cards so you can just slip your photos and writing in the pockets and be done with your project. 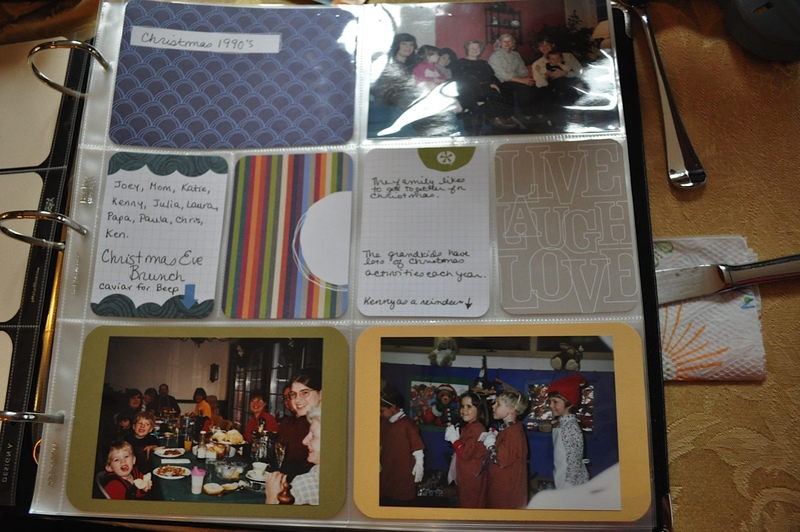 You can fit four 4x6 photos and four journaling blocks on each page. It was created to document your life week by week but as Becky says, you can use the system any way you want. So, I got the kit and set it up in a way that would work for Mom. 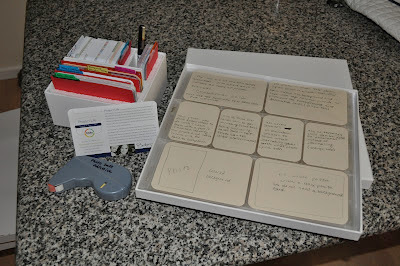 I labeled the elements of the kit with coordinating directions written out onto cards and put them into one of the pocketed page protectors so people can see exactly where everything goes. Project Life adapted for use for a person with dementia. Basically, you can take a few photos out of Mom's many boxes of pictures and set a few in front of her. You ask her what photo she would like to put in the album first and she can point to it. You can ask her what she knows about the photo or who is in it and write that on a journaling card. If she does not know, you just leave it blank. You then point to two of the photo pockets and ask "Would you like to put the photo here or here?" and Mom can choose where to put the photo. For the title on each page, you can take out two title pages and ask Mom which one she would like. Many of Mom's photos are 3x5 or 4x4 so I cut extra 4x6 colored cardstock so people can adhere the photo to a background, again giving Mom a choice of two colors and asking her to pick the one she likes the best. Sometimes Mom can figure out how to slip the photos and journaling into the pockets and sometimes she can't so we can put them in for her, but always give her the choice of where to put it. This is an activity that allows Mom to feel the feelings of the events in the photos even if she does not remember who is in them or what the picture is of. It gives her choice of where to put the photos and what colors to use in a simple way with a template of the pocket pages to follow. It is an ongoing activity since we have a ton of photos and it is repetitive but not the exact same thing each day. The directions are simple and color coded so anyone who comes over can do this activity with Mom. I am very grateful to Becky Higgins for creating such a simple system that I could adapt for Mom who has dementia. This is a great meaningful activity for all of us to do together which will last for generations to come. 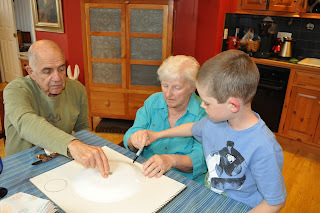 Over the past few weeks, we have tried a few Montessori based activities with Mom. We are learning what will work for her as we go along. It has been really interesting to try different things that you think will work and are accessible for your loved one and find out there may be more limitations for them than you realized. It all depends on what kind of dementia and other issues your loved one has as to what will work for them. 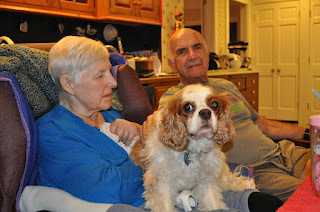 Mom has Lewy Body Dementia which means she has Parkinson's-like symptoms so her hands shake and movement is hard for her. In the two activities we tried, it was hard for Mom to do the motor skills to complete the projects, but our son was good at helping her out. We did both of these projects with me and our eight year old son assisting Mom. Our first project was to make templates for setting the table. Montessori uses templates in many different ways in the classroom. For instance, the world map puzzles have templates (control maps) in varying degrees of detail (labeled and unlabeled) in order to help the children learn where the states and countries are and start to memorize the maps. We made place setting templates with Mom because Mom likes to set the table but does not remember where the items go. Part of Dr. Cameron Camp's suggestions for Montessori Based Dementia Care is to have your loved one help you make materials for activities as much as possible. So with the place setting templates, making the templates was an activity and now she has the activity of setting the table each day if she wants. Mom had a hard time following directions with this one as she needed to trace things, like a plate, with a marker. Those directions were a bit to complicated for her but working together we got the project done and she said she liked it. Mom is able to use the templates to set the table although she does sometimes question if she should be using them because she does not always remember we made them with her for her; she thinks they belong to us instead. Our second activity was pouring sand. I always loved to do this when I was little, and now there are many more jars and things to pour colored sand into which can actually make pretty decorations in your home. We put each color of sand into a cup and used a funnel for Mom to pour the sand into the glass block display. We did find that Mom can not lift the cup high enough on her own, her arms are too weak, so we needed to help her a lot with that. While she enjoyed the project, I am not sure it is really that accessible for her. The Montessori method of simplifying and finding activities that match the skills of the person is working, it just takes a while to find out what is realistic for your loved one to do. Also, to make enough projects to have something to do multiples times a day would take a long time in a home setting and some of the activities are not reusable. I am working on a scrapbooking activity, which would be ongoing and anyone who comes over can do with Mom. I am really excited about it so as soon as I get that done I will post it. "People with dementia can't learn new things." "All you can expect him/her to do is sit and watch TV." "Dementia patients can't contribute to society anymore." "You can have a person with dementia do the same task over and over again because they never remember it anyway." My family and I have been told all of these things about dementia. We have been told to put Mom in an adult daycare where they fold towels over and over again. In our hearts Dad and I just felt that this was not right. We knew there had to be something better out there. We knew Mom, and each person with dementia, is still a person who deserves dignity and respect and who has the ability to contribute to the world in a purposeful way. From the medical field though we were hearing the exact opposite. Instinctively I knew that what the medical field was saying could not be what laid in store for Mom. In fact, my whole theology revolves around showing people dignity and respect and helping people find purpose and meaning in their lives. With those two things, people feel happy, whole, and find their connection to that which is greater than themselves (God, the Universe, etc...). What people were saying about Mom went against my theology and my understanding of the world. I knew it couldn't be true, but had no proof until this week. For two days Dad, Mom's caregiver, and I attended a Montessori-based dementia training with the Center for Applied Research in Dementia with Dr. Cameron Camp. This training showed me that we can help Mom have a wonderful and meaningful life even with her Lewy Body Dementia. What annoys me is that I did not see it before. I went to a Montessori school until eighth grade and I know that is where the core of my belief system came from. 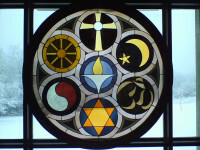 I have preached about Dr. Maria Montessori and how her values are in line with Unitarian Universalism. My son goes to a Montessori school. Montessori has been a part of my life forever, yet I also live in a world which drills it into our heads the belief that people can't learn for themselves and they have no value if they are not fast, brilliant, and controllable. After eighth grade, I learned to live in this system because I had to, but I lost some of myself along the way. That's why I didn't notice that if I just applied Montessori principles to life, we could take care of Mom much better. "People with dementia can learn new things." "You can expect him/her to participate in activities they enjoy every day." "Dementia patients contribute amazing things to society when we give them the chance." "Never have a person with dementia do busywork, like folding towels all day, that does not honor their worth and dignity." 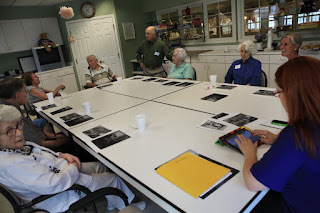 You will see many blog posts in the future about the Montessori method and how we will use it in our care with Mom and with the participants in our weekly dementia program. Right now I am just so excited to be reminded of how Montessori changes lives. 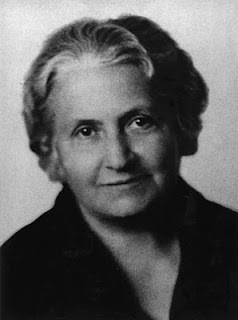 As a person with mental illness, I know the Montessori teachings were what enabled me to believe in myself and figure out how to use my strengths to contribute to the world. Without it I would have only focused on what I can't do. Forgetting about the core Montessori teachings meant that we were only focusing on what Mom can't do. Well, no more. Mom has lots of great things ahead of her thanks to Dr. Camp and his colleagues who have brought Montessori to people of all ages. I am glad now I can return to my parents the gift of Montessori that my Mom and Dad gave me. It is hard to describe what ArtCare is, which we use for our programs of the Carolyn L. Farrell Foundation for Brain Health. ArtCare is not art therapy. Our goal is not to cure an illness because so many of the diseases of the brain can not be cured. Particularly with dementia, there is no cure. What people really need is socialization, joy, and the feeling that they can still contribute something beautiful to the world. For our friends with dementia, this is what we are using ArtCare for. For our other programs for mental illness, ArtCare can help in the treatment process, but again it is not a cure. ArtCare is used to bring focus, purpose, and meaning into people's lives. The art that we have been focusing on for our friends with dementia is abstract art. In the later stages of dementia and people struggling with Parkinson's or arthritis, detailed art that looks like an object is too frustrating to create. Art where you can let your imagination soar is the aim of our program. However, it is hard to get people to let go of thinking art has to look like something, be something, and just have fun like they probably did when they were little. However, as people get used to the process, they see the beautiful things they can create just by using their imagination and letting go of any art "rules" they thought existed. We always say in our programs that there are no rules and you can't make a mistake. Whatever you do is exactly right just the way it is. Zentangles art practice. Calligraphy by Mike Gold, CLF Foundation Board Member. Papercrafting. 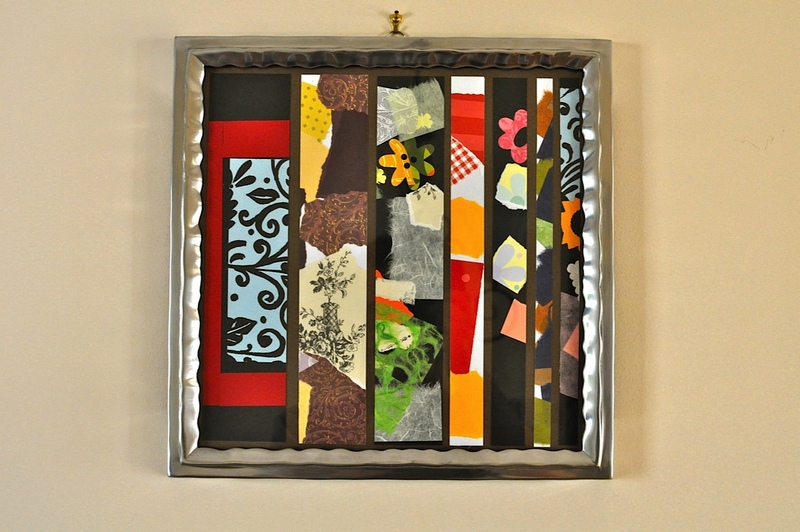 Individual collages made with patterned paper, cut to create one piece of artwork. As I mentioned in my previous post, Mom fell recently and often a fall can lead to a downward slope. However, I really was not expecting this quick decline of Mom's in the last week. I just don't see how the fall, which did not hurt her, was just a bit scary, led to where we are today. She is having trouble feeding herself and can't always figure out how to use her utensils. She is much more confused, sometimes talking like it is 20 or so years ago, but still fully aware that I am her adult child. Her hallucinations have increased. For some reason she thinks her house is actually three houses. Frequently what she says is completely out of context and we feel bad we can't figure out what she is trying to tell us. I am getting the sense that her anxiety has been heightened so much after the fall that everything is scary to her and anxiety can make you pretty confused and flustered. It can't be helping her already compromised brain. Dementia is just so darn frustrating. In our experience, Mom stays stable for a bit but then gets worse by a big quick change rather than a gradual change. Just as soon as we get used to taking care of Mom the way she is, she all of the sudden gets a lot worse. You feel like you are always playing catch up and not doing enough because you can't figure out how to help her fast enough. It's like any illness with no cure. When medicines don't help and there is nothing you can really do, you just have to do the best you can. Now that we have moved from home, Mom and Dad are in need of some more help. Mom can not be left alone at all so unless someone else is in the house, Dad can't go out to the grocery store, to meetings, or really to do anything. Before we left, they got an amazing caregiver who comes four days a week for four hours, but Dad is realizing that they could use her more often. However, this is hard for Mom to accept, and I can understand why. For someone with mid-stage dementia, they still know much of what is going on. They know they are sick, but they do not really know how sick they are. They may not believe they need to be supervised at all times, after all, they are adults. As Mom says, she does not want a "babysitter." It is very hard to say that her caregiver is not a babysitter though. They do projects together and she helps Mom get dressed and takes care of daily tasks, much of what our babysitters do for our son. I really do not know how to help someone with dementia accept that they need a caregiver. They don't believe they need one and they don't understand why a family member can't be there 24/7. For some people I am sure they even become angry at their family for getting a caregiver rather than family staying with them all day. I can only imagine what they might be feeling: abandonment, misunderstood, angry, like they are being babied, and betrayed. All of this is understandable. These are the hard times when it is up to us to make decisions for our loved one with dementia because they can't make the decision for themselves. We will always question when we do this because we really want our loved one to be ok with the decision. We want to treat them as adults who can still make rational choices and we do not want to upset them. But on the other side of this, I know what it is like to have someone else make decisions for you when you can't. Sometime when my bipolar disorder is particularly bad, my husband has to make decisions for me, like make me exercise, go to bed on time, or tell me what to eat. When this happens, I am pretty mad at him for making choices for me, after all, I am an adult. But in the end, he is really taking good care of me and helping me have a better life. People with dementia may never be able to look back like that and say that they understand we are caring for them well. However, if we were to go back a few years before the disease presented itself and asked our loved one if this was a good decision, they would probably say "yes." Sometimes we have to hold on to the understanding that if our loved one could understand, they would be happy with our choice. We have expanded the ArtCare for Dementia program that we run from the Carolyn L. Farrell Foundation for Brain Health to include other forms of art besides just the TimeSlips storytelling. Today we had our first papercrafting session and it went really well. I have been scrapbooking for years and know how fun and meditative working with paper can be so I wanted to bring that to our ArtCare participants. I also needed to think of something that would be simple to do no matter how well your organizational skills were working or your manual dexterity. I wanted everyone to know that we are all artists. Today I brought different scraps of colored and patterned paper and let everyone tear the paper up and glue the strips onto a white background. 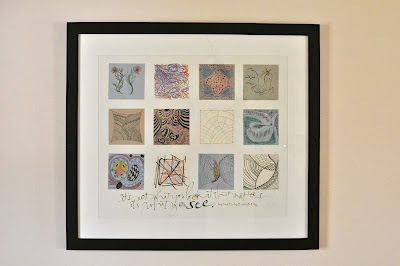 Then I cut those collages up in squares and mounted the squares on colored notecards. When you describe the project, it is hard to imagine the beautiful artwork that will be created out of the collages, but just look at these pictures to see what everyone made. 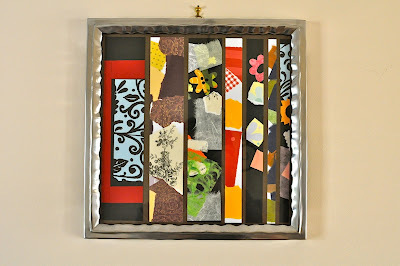 The collages turn out to be mosaic and kind of a stained glass effect squares that can be set off wonderfully by a colored background. The best part of all this was to see everyone have fun with the collage and really see their smiles once they saw their notecards. Projects like this really show how if we just let our imagination go, we can all create beautiful art. The purpose of our ArtCare programs is to bring joy into people's lives, and I think we really did that today. 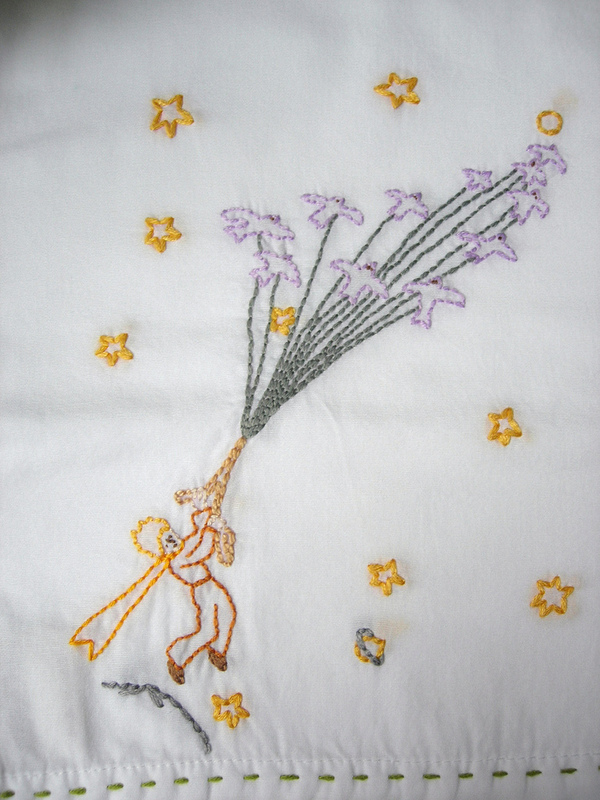 This is a project you can easily do at home with your loved one with dementia. Then they have cards to send people for birthday's, anniversaries, etc... or put them into stacks of 5 cards with a bow around them and you can give them away as presents. 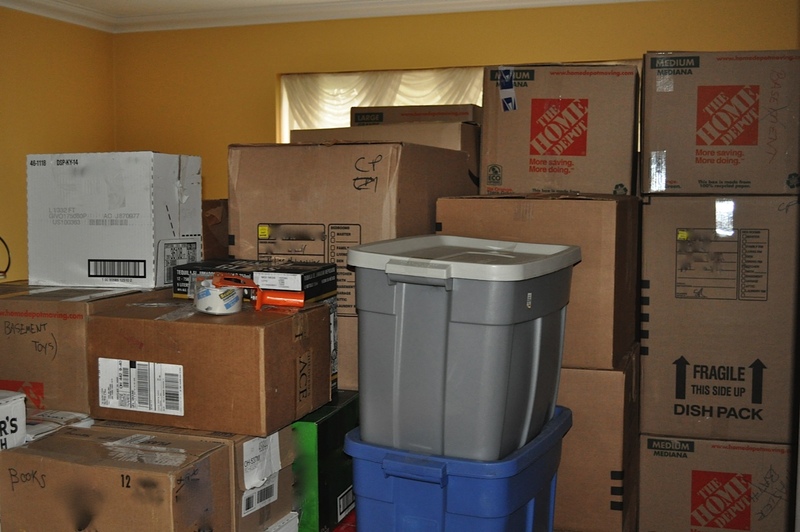 It is with deep sadness that my family and I have decided to move out from my parents house. We have been here for two and a half years and have been able to help my parents in many ways. However, I am sure all of you caregivers know, 24/7 caregiving can be very hard to handle. It takes up a lot of your life and while you feel honored to do it, it also takes a tole. For my family- me, my husband, and son,-it was becoming too hard for us to maintain our life and be live-in caregivers as Mom's care needs have significantly increased. We have discovered that we need our own space in order to create a strong family unit for the three of us. We are only moving 2.5 miles away and we will still be helping to care for Mom. This actually allows for some help to come into the home and we have found a great caregiver who likes to do projects with Mom. She has worked as a nurse with the elderly population and really knows how to communicate with Mom and engage her in projects. I think this will actually make Mom's life more joyful as she will have more things to do and enjoy. I do wish we could remain living with Mom and Dad as we love them very much and want to help as much as possible. It makes us sad to know we won't be here all day for them. However, as all of us children need to remember, our parents want us to be happy and healthy-they want what is best for us. Our parents never want us to give up too much of our lives or ourselves in order to care for them. Mom and Dad are supportive of our decision and are looking forward to having us take over some of the big family events in our new house. We have had many good times living with dementia and we feel honored to have been able to take this journey with Mom and Dad on a daily basis. Jeff and I have learned a lot about family, love, and life by the example of my parents. We are so appreciative of all they have taught us and how close we have grown together. We are looking forward to the ways in which we will still be able to help them in the future in our new home. I will of course continue to keep up on the blog since we will still be caregivers for Mom. It will be interesting to see how this change goes and what new roads lie ahead for all of us. It becomes increasingly hard to make sure Mom's day is filled with enjoyable activities for her since her ability has deteriorated so much. People often suggest that she can read, but she can no longer see well enough to read large print material. It is not that she is losing her sight, but rather that she is seeing things differently. Words literally jump off the page and move around on her, so she just can't read anymore. However, my Dad has started reading to my Mom, almost on a daily basis now. I have to say, it is so cute! It is great to see them spending time together and reading something that they can then both talk about later. Sometimes we are unsure about offering to read to someone for fear of treating them like a child, but many people really like to be read to. It can allow them to find enjoyment in reading again if they can't read on their own and often listening to someone else read is a relaxing and comforting experience. 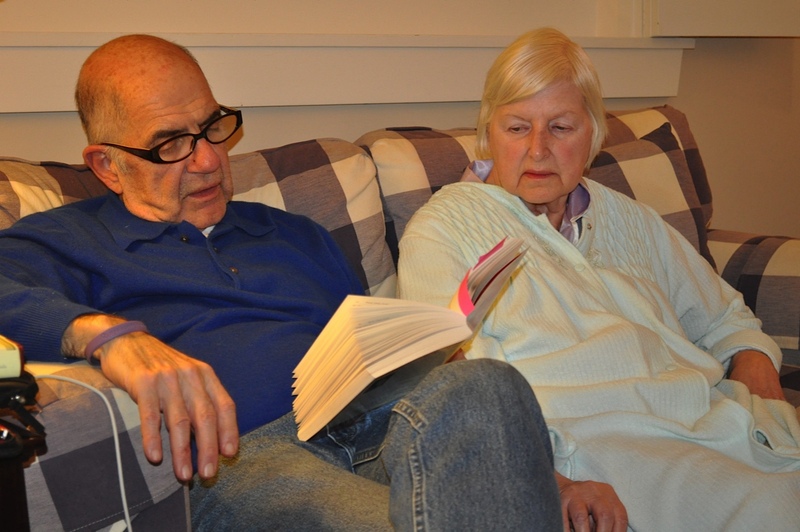 I think it is great that my fast paced Dad takes time to sit and read with Mom. It shows how much he loves her and likes to care for her. How Does Your Faith Help You? I was recently talking with other caregivers of people with dementia/Alzheimer's and many of them commented on what a support their faith is to them. Some expressed that they believe God has a purpose in all things and they trust that purpose. Some said they pray for things like humor in hard times, or patience to help them understand better. Some said they make a point to find the blessings in the midst of this illness. For me, my I find my faith helps me accept what is right in front of me rather than wishing things were different. My faith helps me remember that all we have is the present moment and if I can learn to stay in that moment, I can truly enjoy what good is happening, because there is always some good somewhere. My faith also shows me the great love that exists in this Universe, lived out by communities of caring people who help me and my family along this path.